Yes actually, your bum does look big in that. I absolutely hate park jobs like that. Only thing worse is the stupid diagnonal park across the lines because mr or mrs ‘I can’t drive’ couldn’t be arsed straightening out the wheel after turning into the parking spot. This should be a fineable (and towable) offence. I hate it also, especially when I do it. Don’t have a 4wheel drive I just have no idea how long the car is. Don’t be stupid, many carparks are marked with spaces less than 4.8 m long and have wider aisles. It saves paint and is within the standards for carparks. Most vehicles will hang over by some distance, especially if the vehicle opposite them (not shown in this photo) is overhanging into their space and forcing them to stop before fully entering the space. In this case there’s a wall, but I don’t recall how much space there is ahead of the wall. But the pic wasn’t even a comment on allegedly bad parking; more a poke at 4WDs! Chris Till, that will give the many who drive them without skill or talent a legitimate reason for their accidents and incompetence. My concern is more about the tow bar (which is pristine I’m sure) and someone’s shin. 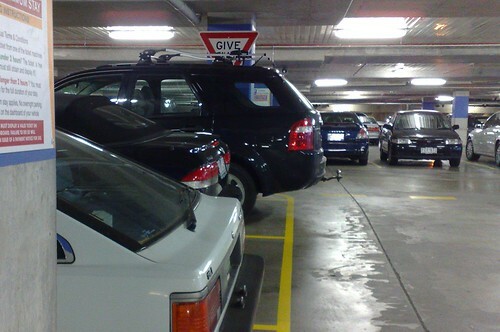 My Volvo 4WD is shorter than a Commodore so I fit neatly into most parking spaces. i dont mind 4WD so long as they are fulfilling their purpose in life – i really hate those BMW, Porche and Audi 4WD that never have and never will get a glimpse of a gravel road. This morning in multi-level carpark at about 8.00: L Plater in very large 4WD BACKING into a tiny space and holding everybody else up for about 10 minutes. So many thing wrong with this, not least that the poor lad’s parent is obviously not teaching consideration for other road users! So sorry you felt compelled to read and comment on it John. 4WDs are a sad sign of our society becoming more Americanised or the worst of Americanisation where bigger is better, or people feel safer in a large vehicle. I hope the tax and emissions concessions don’t still apply to them? 1. Whatever happened to 4WD’s requiring a truck license? I take it that law never got passed? Was it ever offically proposed? 2. I think there’s a law stating that towbars must be removed when not in use (if not permanently attached to the vehicle) – true or false?